Razer Phone launched with world's first 120 Hz UltraMotion display, 8GB RAM and Snapdragon 835 processor. 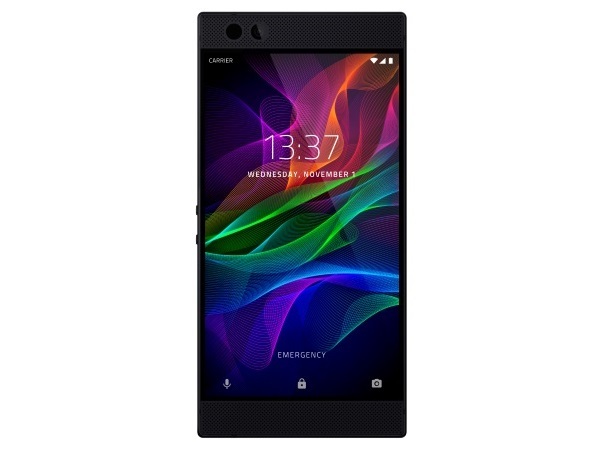 Razer today unveiled the Razer Phone, an Android smartphone with world's first 120 Hz UltraMotion display. The first device from Razer's mobile division, the Razer Phone comes with 4000 mAh battery and features Dolby Atmos audio technology. The Razer Phone is equipped with the world's first 120 Hz UltraMotion display that delivers the fastest refresh rates and smoothest graphics among today's smartphones. UltraMotion's adaptive refresh technology synchronizes the GPU and display to remove image tearing or lag while driving efficient power usage. The 5.72-inch display - a Quad HD IGZO LCD - delivers vibrant and sharp images with a wide color gamut. The Razer Phone comes with the latest Qualcomm Snapdragon 835 Mobile Platform and a massive 8GB of RAM. Users can fine-tune their experiences with the Razer Game Booster app, and the phone's best-in-class thermal design reduces throttling to maximize power and performance. The Razer Phone's sleek, 8-mm-thin aluminum body is a beauty to behold and to hold. It comes with Android Nougat and will receive the Android Oreo upgrade in spring 2018. The device comes with Google Assistant integration. The Razer Phone packs a large 4,000 mAh battery, allows gamers to keep playing all day long, while Qualcomm Quick Charge 4+ enables rapid charging. The Razer Phone is powered by Dolby Atmos technology to provide true cinematic audio via front-firing speakers with dual dedicated amplifiers. A THX-certified USB-C audio adapter with a 24-bit digital audio convertor (DAC) guarantees audiophile-quality sound with one's favorite headphones. The Razer Theme Store allows gamers to customize their phone, changing wallpapers, icon packs and colors throughout the phone. It includes custom ringtones by Razer DJs and custom wallpapers inspired by the world's top gaming titles, such as "Shadowgun Legends". 1,337 sets of the Razer Phone Special Edition with Razer's iconic green triple-headed snake logo will be available from Three stores in the United Kingdom, Ireland, Denmark, Sweden, at Razer Store in San Francisco, and online in the USA and Canada via Razerzone.com. The standard edition of the Razer Phone features a chrome triple-headed snake logo. Recommended Retail Pricing: US$699.99 / €749.99 / £699.99.